How are photos, pictures and symbols used to communicate? Photos, pictures and symbols are incredibly useful in communicating about every day life such as places, people or activities. Whether you choose to communicate with photos or pictures or symbols depends on individual preference and ability to understand what the picture means. Sometimes a mixture of all three are used. Where are photos, pictures and symbols used? Planning | menu boards | timetables | communication passports | staff rotas | information on a door to indicate what sort of room it leads to. Helping with choice and independence (see the Daily Planning story, above). Producing accessible information leaflets e.g. using simplified text supported by symbols and photos to produce the minutes of a meeting or a leaflet about bereavement. Which to use? Photos, pictures or symbols? The important thing to remember is that photos, pictures and symbols are not equally easy for everyone to understand and use. Cartoons/symbols are simplified pictures and the most difficult to understand. Photographs are the least abstract, and often the easiest to understand. Sometimes people work with photos to begin with before moving on to pictures and finally symbols. Some people will find objects easier than pictures. As a rough guide, you need to know that a person can choose the correct picture out of a choice of at least three pictures to know that they recognise what the picture represents. One advantage of a symbol is that is easier to photocopy than a photo. Where can I find out more about photos and symbols? 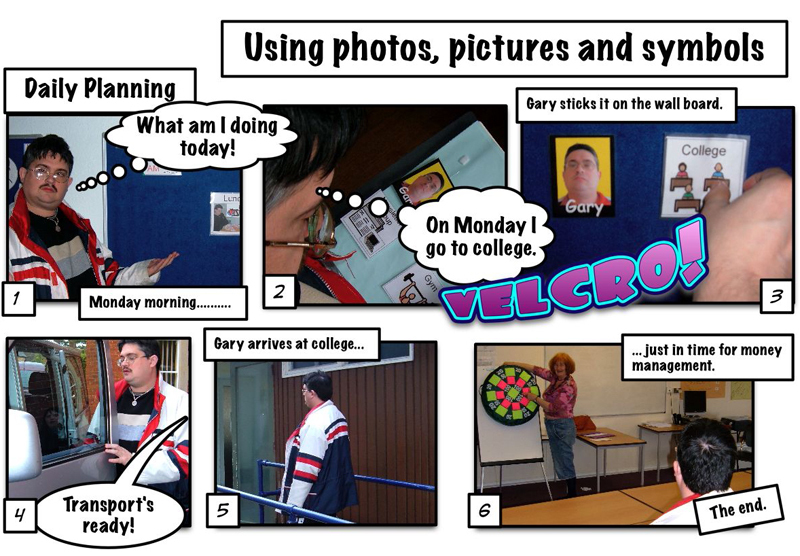 Talk with your local day service provider about the photos and symbols they use to ensure consistency.